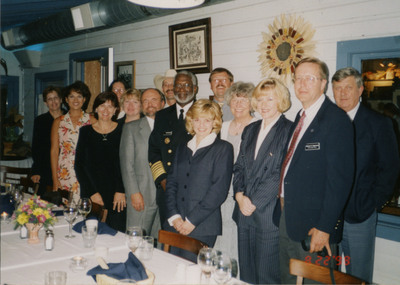 "Group Photo with US Surgeon General"
Rosemarie Myrdal attending a group dinner with Dr. David Satcher, United States Surgeon General. Lieutenant Governor Myrdal stands to Dr. Satcher's left. The rest of the dinner guests are unidentified. Appointed by President Bill Clinton, Dr. David Satcher served as the 16th Surgeon General of the United States from 1998 until 2002. Prior to this appointment, Dr. Satcher held the position of Director of the Centers for Disease Control and Prevention.